Quality and craftsmanship isn't enough when it comes to building a home. It takes communication and guidance from your builder. A successful custom home is judged by not only meeting your budget, timeframe, and needs, but also by whether it fulfills your dreams and expectations of a custom home. New Construction Initially, we'll sit down together and discuss your ideas and your new home's building process based on your needs. We'll address all questions and concerns and clarify individual responsibilities as well. You will be provided with top quality workmanship. 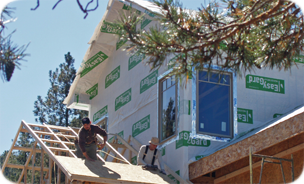 I guarantee that you will be built an energy efficient home, finished with high-quality reliable brand name products and materials, providing your home with lasting value at an affordable cost to you. We'll take care of zoning, permits, well determination, septic system requirements, restrictions, etc. There is no need for you to worry - we'll handle it all. Your home will be finished with perfection and I will follow-up with you on a regular basis to ensure that you are happy. Major Renovations or Additions Maybe you've lived in your home for many years and love the location but want to modernize or enlarge your living space. Maybe your family has grown and you want to add rooms or even office space for a home business. Together, we will create a home or space that meets your needs and enhances your lifestyle. Existing PlansLet us get you started on your dream home! We can start with your ideas, a rough sketch on a cocktail napkin, or professionally drawn architectural plans. The sky is the limit! I can help you with dimensions, aesthetics, design flow, finishing ideas or color schemes. If you only know that you desire 3 bedrooms, we can come up with the rest together! Vacant Land We have several lots available that have been chosen for superior views or level building entry. Vacant land has become difficult to locate so if you find yourself looking and coming up with nothing but frustration, please call me! I can show you the lots we have available or help you find one in an area that you may have your heart already set on. I'd be happy to help you learn about elevations, available water, ease of digging, or septic requirements - all before you're locked in to a land site so that you can make an educated decision about your future home site. We want this to run smoothly from the beginning!